This week, luxury hotel chain St. Regis Hotels & Resorts stepped foot into Boston as their luxury condo tower broke ground in the Seaport. The Seaport tower is the second St. Regis-branded standalone residential property to see the light of day following a $100 million luxury housing development in Westchester County, New York that broke ground earlier this year. The 22-story tower will be located at 150 Seaport Boulevard on the north side of the Boulevard, just east of the intersection with Northern Avenue. Boston Harbor borders the project site on the north and east, with Commonwealth Pier further east and Pier 4 adjacent to the west. The site contains approximately 49,627 square-feet including approximately 16,527 square-feet of land and 33,100 square-feet of adjacent water sheet. "Boston is a dynamic residential market and perfect fo rht modern glamour of St, Regis-branded residences," said Dana Jacobsohn, Marriott's vice president of global mixed-use development. "We're excited to add The St. Regis Residences, Boston to our growing portfolio of branded residential projects around the world." The development will replace the existing buildings with a signature mixed-use building containing up to 283,700 square-feet of restaurant/retail space on the ground and second floors. The building will also include a three-level, underground garage containing up to 179 parking spaces to serve both residents and retail/restaurant on the project site. The condos will come with access to a suite of St. Regis-branded luxury services, including concierge and butler service, and amenities such as a swimming pool, a spa, a health club, a library and a golf-simulation room. 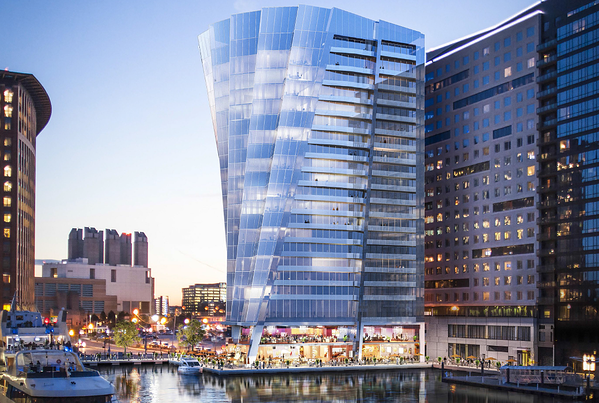 The building will be situated on the project site so as to open up views of the harbor from Seaport Boulevard and B Street. Its stylish architectural design is reminiscent of a sail with layered massing that projects over the sidewalk to the south. To further emphasize the movement towards the water, the building gently curves away in a sweep of serrations, which twist 90 degrees, creating a series of sweeping glass sails facing the harbor. 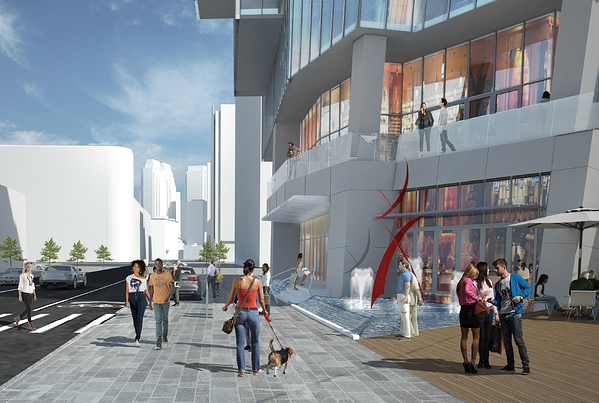 The project will further introduce a new Harborwalk on the north side of the project site, which will extend out from the existing waterfront perimeter. 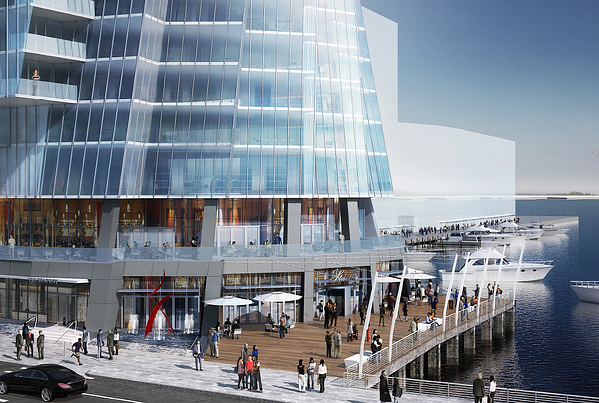 This will complete the Harborwalk between Pier 4 and Commonwealth Pier, thereby allowing an uninterrupted walk along this entire stretch of waterfront. The project site is three-quarters of a mile from South Station, serving the MBTA's Red Line, Silver Line and several commuter rail branches. The MBTA Silver Line Courthouse and World Trade Center stations are each located approximately a quarter-mile from the project site. The ground breaking ceremony was attended by Lieutenant Governor Karyn Polito, Congressman Stephen Lynch and Mayor Marty Walsh. All speakers had heralded developer Cronin Group's active participation in local charities and contributions to the nearby Martin Richard Park. The upcoming development has been financed via Chase Bank for $174.6 million. The St. Regis Residences are expected to introduce a dynamic addition to Boston's urban fabric and the growing Seaport neighborhood. 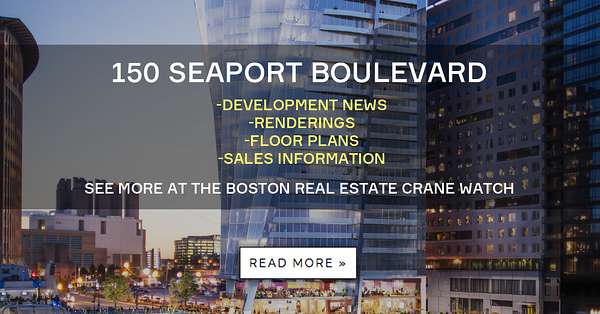 Sign up for a property alert at BostonRealEstate.com and be the first to receive new sales and showing information on The St. Regis Residences, as well as exclusive renderings and floor plans.